Steve Ellis was a former founder of Free Radical Design where they created the iconic TimeSplitters series as well as Second Sight. Before Free Radical, Steve Ellis had worked at Rare at worked on games such as GoldenEye 007 and Perfect Dark for the Nintendo 64. Steve wrote the multiplayer aspect of GoldenEye 007. Currently, Steve is the Managing Director/Technical Direct at Crash Lab. Martin Wakeley was a designer and producer at Rare. You may remember some of his critically acclaimed games such as Jet Force Gemini, Diddy Kong Racing, Blast Corps, and Donkey Kong Land (Game Boy). Martin then went on to work at Free Radical with Steve Ellis until the company was bought by Crytek. Martin had also worked on games such as Haze and Crysis 2. Today, Martin Wakeley is a a Design Director at Crash Lab. Lee Musgrave had a long impressive career at Rare for 17 years and he was promoted to becoming the Head of Art at the company. Some of the games he worked on include Diddy Kong Racing, Jet Force Gemini, Mickey’s Speedway USA, Perfect Dark Zero, Kameo: Elements of Power, Kinect Sports 1+2, and others. Today, Lee Musgrave is the Art Director at Crash Lab. I would like to personally thank each of these talented individuals for doing this interview with NotEnoughShaders.com. These three men are responsible for creating some of the most influential games in our industry and their games were a huge part of the childhoods of so many gamers. I am honored to be interviewing such talented people. With them working together at Crash Lab, I look forward to see all of the great games that come out of their hard work. Please follow @CrashLab on Twitter for the latest info on their games. To see all of the old games they’ve worked on, click here. To see the games they are currently working on, click here. Free Radical Design had a lot of ups (TimeSplitters series) and downs (financial problems). What lessons can be learned from Free Radical Design to make Crash Lab successful? There are many lessons from our experience at Free Radical, but the main one is that game development is a very risky business. Being independent means always looking for the next publishing deal in order to keep the money coming in. Developing original games is risky (publishers might not like them, they might not like that they don’t get to own the IP, it may take longer than expected to make them good enough). Developing technology alongside the games is risky (if it proves to be more difficult than expected, it will impact any games that depend on it). Growing a company is risky (more staff all wanting to get paid every month increases the amount of income that you need in order to stay in business, as the company grows more people need to be in management and admin roles so the average cost per unit of work increases, and generally smaller teams are more productive because they aren’t stepping on each others toes as much). Many of the problems we faced at Free Radical came down to time or money, which are inextricably linked when you have a lot of staff – time costs money. The biggest change with what we are doing now at Crash Lab is that we aren’t getting into situations where we might need to ask a publisher for more time (and consequently more money to pay for that time). Our overheads are much lower – we don’t ever expect to have hundreds of staff – and we are only dealing with publishers at the time when most of the timescale uncertainty has passed – when we know that the tech is finished and working and the game concept has been proven. We are also balancing the risk of creating original IP with licensed projects – we’re currently working on one that we haven’t announced yet that we’re very excited about. For the next generation game consoles, some gamers worry about development costs and team sizes growing out of control. We’ve seen so many studios shutting down this generation with plenty of layoffs. You had mentioned in an Edge interview that pretty much every FPS loses money. How much higher do you predict development costs will get with future consoles (Next Xbox, PlayStation 4) than current Xbox 360/PlayStation 3 games? Is there a bright future for console gaming or should the industry be worried? Ah yes, I made that comment in passing and learned the lesson that it is difficult for people outside the industry to understand or believe the economics of the industry, despite the fact that so many studios are shutting down or downsizing. When you pay £40 for a game the developer doesn’t get £40. They’re lucky to get more than 10% of that – for a game that probably cost £10-15 million to develop. When you pay £30 to buy a pre-owned copy instead, the developer gets nothing. I don’t see anything on the horizon that is going to fundamentally change the cost of development – as consoles get more powerful, the required development effort (and therefore cost) increases. The options: sell at a higher price (unlikely), sell more copies (probably unlikely) or use a different business model. It seems to me that a suitable alternate business model has to be found. The mobile sector is facing the same issue, just at a different scale. As the power of smartphones and tablets increases, the complexity (and therefore development cost) of games is increasing. However people are becoming less willing to pay 69p / $0.99 for a game. New business models are proving to be more successful. Can you talk about the different games that are in development at Crash Lab such as “Twist Pilot” and “Flying Rocket Defense”? Out of all the games your studio is working on, which game are you most excited about? Because of our small size and low overheads, we’ve had the luxury of being able to experiment more than we ever did in the past. We’ve been able to prototype things in order to work out if they are fun. Twist Pilot and Flying Rocket Defense were products of this – they are the kind of games that I’d always wanted to have a go at making and they have been great fun to work on. I’m excited about all of them in different ways, and it will be great to see how they are received. As we passed the prototyping phase it made sense to choose one to focus on as our initial release. We chose Twist Pilot, and it should be released in October on iOS, Android and PlayStation Mobile. We’ve also got a licensed game in development that I’m very excited about. I’m not allowed to talk about it just yet, except to say that it’s an absolutely beautiful 3D game, ultra-accessible, and releasing before the end of the year. We live in an interesting time where indie developers don’t need publishers to fund their projects. Obsidian’s Project Eternity project reached over $1.1 million in funding on Kickstarter, and Double Fine raised over $3.4 million dollars in funding on the same site. I think Rare/Free Radical fans would love to support any project from the people behind Goldeneye 007, Perfect Dark, Timesplitters 2, and Diddy Kong Racing. Would Crash Lab ever consider using Kickstarter to fund future games, and how do you feel about so many game developers using the site to fund projects? That’s an interesting one. While I’m happy to see some interesting projects raise funding that they wouldn’t have been able to raise through other methods, the fact that they couldn’t raise funding through other methods ought to be a red flag to anyone who contributes. Essentially, Kickstarter is asking people who don’t understand the risks and challenges of the industry to fund it. I’m sure that there will be some high-profile successes as a result but I expect a fair amount of disappointment too. Game development is fundamentally a creative endeavour, which doesn’t sit well with budgets and schedules. Things often don’t go according to plan, and games frequently require more time and more money than the developers initially thought. Publishers deal with this all of the time, but what happens when a Kickstarter project spends all of it’s money without completing development? Does it get abandoned? Do they ask for more money? Do they release an unfinished game? None of these are going to be acceptable to the people who have contributed. It has been suggested many times that we set up a Kickstarter project to develop a TimeSplitters game. Leaving aside the fact that we can’t do that because Crytek owns the TimeSplitters IP, personally I don’t think that it is currently possible. I think that the novelty of Kickstarter and the surrounding press coverable were a large part of the reason that Double Fine were able to raise as much as they did. I don’t expect games to be routinely funded that way, and I don’t expect that figure to be significantly exceeded any time soon. However, FPS’s are much more expensive to develop than point & click adventure games. To put this in context, Double Fine Adventure raised about as much money (before fees) as it cost to develop GoldenEye 007 on the Nintendo 64 in 1997. A modern FPS would require several times as much funding, and I don’t think that that is currently achievable using Kickstarter. The games you are developing for mobile devices are controlled with a touchscreen. Is there any interest in porting some Crash Lab projects to other devices with touchscreens like the Wii U’s eShop, PS Vita, 3DS, or Microsoft’s SmartGlass? Also, what is your opinion of the Wii U? Yes, we’re interested in any device that makes sense for the games. The main constraint is that at our current size we can’t do everything at once, so we have to carefully choose where to focus our resources. Would you like to see the original TimeSplitters games (TS1, TS2, TS3) and Second Sight released in HD on digital distribution services like Xbox Live Arcade, PSN, and Wii U’s eShop? We had a “HD” downloadable version of TimeSplitters 2 in development at Free Radical in 2008. I don’t know what happened to that but yes, I’d love to see it released at some point. Maybe it could be the catalyst that is required in order to raise enough interest in TimeSplitters 4 that a publisher might want to fund it. As a design manager at Crash Lab, what is a typical work day like for you, and which game are you having the most fun designing at the moment? It sound like a cliché but no two days are the same. Probably my favourite aspect of mobile development is the speed with which you can prototype new ideas. Having an idea in the morning and being able to play it by lunchtime is amazing. Blast Corps was worked on by no more than 7 developers at any one time. TimeSplitters 2 didn’t have more than maybe 30 to 35 people working on it. But now I read about games like Resident Evil 6 which had around 600 people working on the game. How did the gaming industry go from teams of 7 people to teams of 600 people? Good question, and I have no idea what the answer is! I guess it was in response to the players demands for more content and ‘cinematic experiences’. Working on a game with 599 other people has no interest to me, but as a consumer I enjoy playing games like FIFA so I see it has its place. The biggest problem when you scale team sizes is communication. With Crash Lab, and on Blast Corps, the team can sit in a room with a cup of tea and discuss the game; with a team of 600 it’s impossible for individual voices to be heard. You had a very interesting blog post on the official Crash Lab site about game evaluation and how Nintendo takes game evaluation very seriously. I’ve seen some developers being criticized for rushing games out in a shoddy state, and then releasing patches later. For example, “Fez” on Xbox Live Arcade received controversy because they released a patch to fix some problems, but the patch caused other problems in the game. So then they find themselves in a situation where they need to “patch a patch”. With the ability to release patches/updates on consoles, do developers take game evaluation as serious nowadays compared to when consoles didn’t have patches/updates? Patches have certainly changed things. There is no longer the urgency there was to get a game ready and bug free for manufacture when there is the possibility of a day one patch. It’s hard to say if developers take submission as seriously; in my experience developers always take pride in creating the most polished product possible. One of the dangers with patches is the inevitable last minute nature of them. In a lot of cases you have a game that has been in continuous QA for the best part of a year and then a patch gets added at the very last moment which may contain some fundamental changes but will only have had hours worth of QA. It’s easy to see how developers can get into a situation of patching patches. It has also changed the developers role because the development process no longer ends when the game is handed over to the hardware manufacturer. With Cartridge, once a game was approved we would put our feet up and think about the next project. These days with console games you are working on bug fixes, DLC, and things like server support all through the release of the game and beyond. Back in the N64 days of Rare, did the employees regularly play the competition’s games (PS1 games)? How was PlayStation 1 perceived by employees at Rare during the N64 days? Also, what were the big games that everyone played at Rare on their free time when they weren’t working? The PlayStation was viewed with a degree of cynicism. We were exclusively Nintendo focused at Rare and the traditional competition was Sega. We didn’t know what to expect but it was clear from the off they had nailed the marketing of it. One of the cool things about Rare was we were always encouraged to play games. We had Saturn, 3DO, Jaguar, Virtual Boy and a host of Arcade machines around that time and they all got played fairly equally. With any new thing there are always those that fear change. I remember Blast Corps being described as ‘looking like a Playstation game’ which was intended as criticism but we took as a compliment. There were many leaked photos back in 2010 of a Jet Force Gemini beta/prototype for Game Boy Color. Can you share any information on whether this game actually exists, how far along it was in development (completion), the type of gameplay it had, and why it got cancelled? There was a rumor that Timber 64 was a game Rare was developing during the N64 days. Basically, the rumor was that Timber from Diddy Kong Racing would get his own game just like Banjo and Conker did. Pipsy and Bumper would co-star in Timber 64. Can you or Lee provide any details on this rumor? It’s interesting because Diddy Kong Racing takes place on Timber Island so it seemed that Rare really liked the Timber character. Martin Wakeley says: I couldn’t say for definite but I have no recollection of that ever being in development. Where the rumour may have started is that an early version of DKR (I think it was called RC Pro Am at the time) had Timber as the lead character. I’m sure I’ve got a badly fitting Nylon polo shirt with the game logo on it somewhere. Lee Musgrave says: There was never a Timber 64 game. Yes, there was Pro-Am64 that had Timber as the main character, but that became Diddy Kong Racing and that was the end of that. As the lead art director of Crash Lab, what is the process that you go through to establish a game’s art direction? And how does that process change when doing the art direction for small sized projects compared to a big budget game with large teams? The process from my point of view is the same for every project, try to come up with something new, interesting and great . . . although the variables for each project change and this dictates the parameters you’re working within for each game. Variables including firstly, the type of game we’re building (big, small, 2D, 3D, character led?, funny?, serious? camera viewpoint? etc. ), who we’re building it for (ie. what is our intended audience demographic, everyone? ), the constraints of the particular hardware we’re headed for, the available time for the project . . . and mostly, asking ourselves whether we think we can do something that looks genuinely impressive and is significantly improved over the competition. What motivated you to leave Rare to become one of the co-founders of Crash Lab, and what do you find most exciting about working at Crash Lab? Were you happy with how Microsoft handled Rare during the time you spent there? Back in the day, Rare was an incredible place to work. I owe it an awful lot for the education it gave me and I learned an immense amount from some truly world-class people. I’d been there for 17 years by the time I left and by the end, the Rare I joined had gone. I don’t really attribute that to anything that Microsoft did, but the simple migration to becoming part of a mammoth organisation inevitably changes the atmosphere of a hitherto insular place like Rare. Some of the people embraced the corporate culture whilst others, like me, felt that there was not enough emphasis being placed on real attention to detail or iteration of ideas/features in order to make them great, rather than just being ‘done’ and able to be ticked from a list. In all the projects I work on, it’s the obsessive attention to detail that makes the difference between just doing stuff, and doing good stuff. They are a rare breed (no pun intended), but if I can find and work with people that share the viewpoint that if we try hard enough, we can do things better. It’s motivating. You’re responsible for the great art direction of so many Rare games. You went on to become the head of Art at Rare where you created the visual design of Microsoft’s avatars. Which Rare game did you find the most challenging to work on? Also, out of the Rare games you worked on, which one are you the proudest of? The most challenging game to work on was undoubtedly Kinect Sports 2. I worked as Rare’s Head of Art and the Art Director on that game simultaneously, just before I left, and it was tough going. There were people that shuffled into senior roles on the KS2 team that were pretty new to Rare, and they did not well understand the delicacy of how we typically built things. I think they bludgeoned it with naivety, over-bearing methodology and ‘process’, and missed some of the fine qualities that made the company’s name. It was soul destroying to see it heading off down the wrong path and made it a challenge to stay motivated during development. Proudest of? . . . it will sound odd, but probably Mickey’s Speedway USA. The team built it in record short time, made it look great, and technically, it ran at a faster framerate than any other Rare N64 offering. It was also just pure fun to play. It was a real coming together of a team who all understood perfectly the parameters that we were working within, and we didn’t miss a beat. It’s a simple game, but the execution was precise. 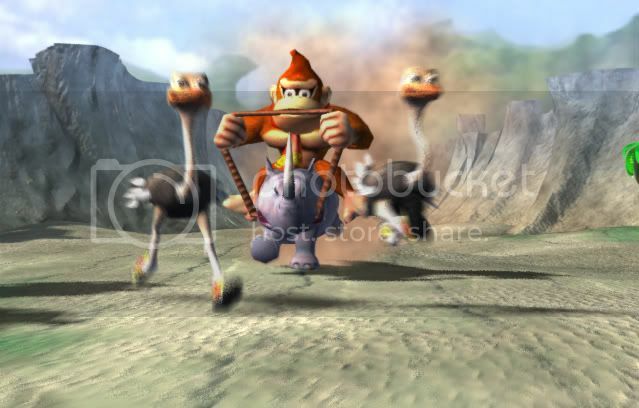 Donkey Kong Racing (GameCube) is kind of shrouded in mystery, and Donnchadh (Don) Murphy told us in an interview that you were the right person to clear up questions because you lead the project. The only time we saw video footage of DKR was a prerendered CGI video at E3 2001, and then the game later turned into Sabreman Stampede. Was there ever an existing playable prototype of Donkey Kong Racing, and why was the game cancelled so quickly? Also, can you provide some insight on how the gameplay, level design, and animal racing would have been like if Donkey Kong Racing had been made? Ha! – yes, I made that video! . . . Donkey Kong Racing was obviously pretty heavily tied to Nintendo as a franchise, and as Rare approached the finalization of a buyout deal with Microsoft it was clear that the game had no future, at least with the ape’s as characters. We switched it around to be a Sabreman game, and there was a great early Xbox prototype – but someone, somewhere decreed that it was a little too old-school for the kind of ‘revolutionary gaming experiences’ that the Xbox was capable of delivering, and so it started down a path of meandering changes, updates and ‘evolution’ that finally saw it run out of steam and fall over. There were some great ideas in the game as it developed though, and I still look back to the early racing game design and think we could have done something great with that. It was a pure racing game, the underlying software mechanics were actually based on car physics, but it also incorporated the idea of riders jumping between different animals mid-race, to always be riding the ones that were bigger or faster . . . we had some awesome gameplay in place, and it was lots of fun – we even had a multiplayer version working – and when you fell off, you had to tap-tap-tap (HyperSports style) to run on foot and catch up with an animal. Fun, but it lost some appeal without the DK universe around it, and Microsoft were unsure of its potential with Xbox gamers I think. Were there ever proposals between Nintendo and Rare to do more more DS /3DS games beyond Diddy Kong Racing DS? Also, did Rare ever make any attempts to pitch Jet Force Gemini, Blast Corps, or the Killer Instinct series for Xbox Live Arcade? Over the years Rare had assembled a great hand-held department, and it was decided that we’d keep it when Microsoft took over even though they didn’t have a handheld console of their own. The thought was that maybe, one day there would be a Microsoft handheld device and we’d need the development experience of the team. We continued to release games on DS for a while but eventually we just needed all the resources we could find to help build Xbox and X360 games, and so with no Windows Mobile or Windows Phone on the horizon at the time, it fizzled out. Rare outsourced some of the conversion/development of Banjo Kazooie for Xbox Live Arcade, and it was kind of a test case for us to see what could be achieved in terms of developing with a partner, keeping our costs low and making some revenue. You can make your own conclusions as to how that turned out by the fact that we didn’t move on to any of the other games you mention. We came close to firing off a conversion of Killer Instinct a few times, but there were licensing obstacles to that, and it never really had enough perceived interest to push it forward. Oh, and of course, there was Goldene . . .